Dying can be a scary thing. Many people live their whole lives with a nagging fear that they’re going to die. In fact, there is no escaping it. We all know it’s coming. But what if there was a way you could get rid of your fear of death once and for all? There is. All you have to do is find a reason why you don’t need to be afraid anymore. 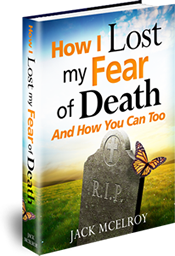 That reason is provided in How I Lost My Fear of Death and How You Can Too. To solve the problem, all the major religions are spread out “on the table” for you: Christianity, Judaism, Buddhism, Hinduism, Islam, Humanism, and Atheism. The major Christian sects––Catholicism, Eastern Orthodoxy, Protestantism, Jehovah’s Witnessism, and Mormonism––are included. We examine what each one says about life after death. Next we examine what the Bible says about life after death. You will discover that your fear of death can be done away with once and for all by believing what the Bible says and doing it.